Welcome to the secret kingdom of Northumbria. From Berwick upon Tweed to Druridge Bay the beautiful Northumberland coast sweeps south, littered with the ruins of historic castles. Alnwick, home to the ancient Percy family, Bamburgh, standing on its rocky outcrop above a magnificent beach of clean white sand. Dunstanbourgh and Warkworth known by Shakespeare and Chillingham, said to be the most haunted castle in England. A visit to Holy Island is a must, as is a boat trip across to the wonderful Farne islands to see the nature reserve with its seals and puffins among others. Pretty fishing villages and stunning golden beaches are all linked by quiet country roads which make exploring this beautiful county and absolute pleasure. You will experience a wonderful sense of freedom under an endless northern sky. Picturesquely situated at the mouth of the river Coquet, Amble is an important fishing centre and has an award-winning marina. There are walks along the River Coquet to Warkworth and south past the harbour to Hauxley with views of the Coquet Island. There are shops pubs and restaurants and regular boat trips from Amble. Lying a mile off shore is Coquet Island with its 80ft lighthouse built on top of the ruin of a medieval tower. It is an RSPB reserve for thousands of puffins, Ida ducks and the roseate tern, one of Britain’s rare seabirds. 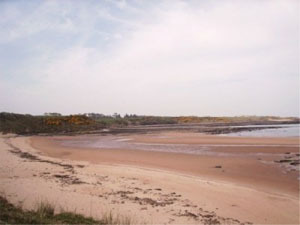 There are nature reserves at nearby Hauxley and Druridge Bay and at Druridge Country Park, there is a lake, visitors centre, picnic areas and access to beautiful, quiet, white sandy beaches. 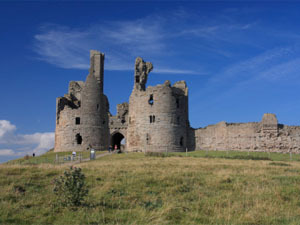 is one of the jewels in the Northumberland crown, a historic village that is unspoilt by modern development and tourism. Dominated by the magnificent, medieval castle, the view along Main Street is one of the finest in the country. It is well worth spending some time in this very pretty village full of interesting art and craft shops, hidden cafes and friendly pubs. You can visit the castle and then walk along the river and row a boat to the ancient hermitage. Hidden by trees and carved into the rock, the hermitage includes a chapel, confessional and dormitory. The walk along the river is enchanting with a stunning view of the castle, perfect for photography enthusiasts. 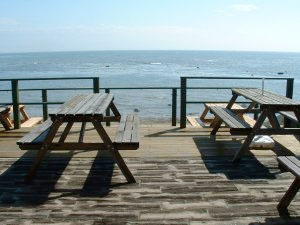 The award-winning beach is twenty minutes walk from the village, however visitors can drive with masses of parking along side the picnic area. Don’t miss a visit to Morwick Ice Cream Parlour just outside Warkworth, it’s a must for ice cream lovers! Just north of Walkworth is the picturesque coastal village of Alnmouth, originally a medieval town, located on the estuary of the River Aln. With it’s colourful cottages and fishing boats moored in the estuary Alnmouth has been the subject of many Northumbrian paintings. A popular tourist attraction, this village has lots to offer including some lovely shops, restaurants and pubs as well as a beautiful beach. One of Alnmouth’s most unique and popular events, the annual art festival runs from the 25th – 26th June, which attracts local professional and amateur artists showing their work. You can also visit the Friary of St Francis where the monks allow the public to walk around the grounds close to the sea. Boulmer, a small fishing village, home to the lifeboat station has an unusual pub called the Fishing Boat Inn with its terrace overlooking the beach. From here it is a short walk to Longhoughton. This mid Northumberland coastal village has a Saxon church and access to the well-kept secret beach aptly named Sugar Sands. This is the nearest coastal village to the market town of Alnwick which makes it a great location for Alnwick Castle and Gardens. Just up from the shore towards Howick, archeologists from Newcastle university have unearthed the best-preserved Mesolithic roundhouse settlement ever to be found in Britain. You can also visit the delightful Howick Hall and Gardens. Arm yourself with a tide time-table to plan the best time to visit this small sandy beach sheltered by about three kilometres of rocky reef running parallel to the shore, which is exposed at low tide. It has deep gullies and pools and many overhangs, and is thickly grown with all the most familiar inter-tidal seaweeds and rich in every kind of marine invertebrate - especially animals that are permanently attached to the rocks, such as sponges, bryozoans, sea firs and the soft coral, dead-man's fingers, aconitum digitatum. From the cottage you can walk down the lane and along the coastal path to the Fishing Boat Inn (approx 3/4 hour walk) or 3 minutes by car along the Boulmer road. Have lunch or dinner before 9pm. Not open Monday except Bank Holidays. Craster has been a fishing village since the 17th century and is today best known for its smoked salmon and kippers. A footpath from the village following green fields and along the rocky shore leads to the dramatic ruins of Dunstanbrough castle. This castle is among the most romantically sighted in the country and towers over the south end of the stunning Embleton bay, one of the finest in Britain. 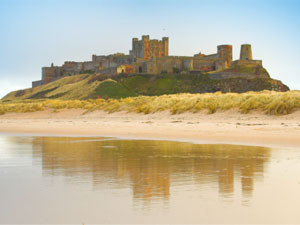 A walk along this beautiful sandy beach will bring you to the pretty village of Embleton. With its 18 hole golf course, said to be one of finest in Northumberland, the flora and fauna in the adjoining sand dunes are managed by the National Trust with the friendly clubhouse open to the public. The main street offers some great friendly pubs with restaurants. The small isolated 18th century fishing village of Low Newton by the Sea, owned by the National Trust is particularly picturesque with its horse shoe of white washed cottages centred around the village green. The critically acclaimed Ship Inn has its own micro brewery producing a variety of unusual ales and together with its freshly caught seafood this is a popular destination. Beadnell is one of the most popular coastal villages in Northumberland and has a lovely 18th century church, which sits along side the Craster Arms pub and the village shop. This lovely old part of the village is just a few minutes walk away from the beach, perfect for crab hunting in the rocky pools or an early evening walk. Further along, just past the 18th century harbour, the beach suddenly sweeps into a beautiful west facing sandy stretch making this a popular destination during the summer period for all types of water sports. It also has a sailing club that organizes regular events during the season. As small fishing villages go in mid Northumberland, Seahouses is unusual in the sense that it is bustling with all the holiday seaside attractions and classic paraphernalia. With colourful buckets and spades adorning the shop windows and worn out lobster pots waiting next to the harbour, this village has real seaside appeal. There are plenty of fish and chip restaurants, arcades, some lovely gift shops, pubs, a supermarket and boat trips to the Farne Islands with fine beaches that lie to the north and south. The beautiful coastal village of Bamburgh, ancient royal seat of the Kings of Northumbria, is set in one of the most breathtakingly stunning areas the country has to offer. The village is dominated by the spectacular castle which stands overlooking the beach at one side and the village on the other. This dramatic position has made it a setting for many epic films. St Aiden, the celtic monk, who founded the monastery on nearby Lindisfarne (Holy Island) died in Bamburgh. When visiting the church, look out for the resting place of Grace Darling, the Victorian heroine, who bravely rescued sailors drowning in the north sea. There is a museum in her memory. Bamburgh CastleThe sight of red-sandstone Bamburgh Castle, standing on a rocky outcrop above a magnificent beach of clean white sand, is breathtaking. The walls and rocks below form a 150-foot precipice. Most of the visible parts of the castle were built in the 18th and 19th centuries, when it was used as a boarding school to train servant girls. The first fortification was built in AD 547 by King Ida and was rebuilt by the Normans. The castle is open daily, Easter to September. North of the castle a cliff-top lane leads to a small lighthouse. The sandy beach, stretching southward to Seahouses, is studded with rocky reefs, but there is safe swimming away from the rocks. The village of unpretentious and charming sandstone houses is best known for its heroine, Grace Darling, who was born in 1815 in a house opposite the church and died of tuberculosis at the age of 26 in a house that is now a gift shop. At the height of a storm in 1838 Grace rowed an open boat to the rescue of shipwrecked sailors. The 21-foot boat in which (with her father, a lighthouse keeper in the Farne Islands) she saved five people from the wreck of the steamer Forfarshire is displayed in the Grace Darling Museum, which is open daily from Easter to the end of September. The Farne Islands is one of the main wildlife attractions in Northumberland. 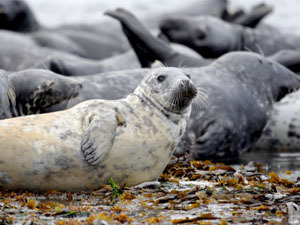 An exciting boat trip from Seahouses will allow you to visit thousands of seabirds and adorable grey seals in their natural habitat. At certain times of the year, visitors are allowed on two of the islands, Inner Farne and Staple Island but during the breeding season, from May to July, landing is restricted. The gorgeous puffins are the favourite with visitors but you may also see kittiwakes, terns, guillemots, shags, oystercatchers, razorbills, ring plover, petrels, eiders and of course, gulls. One of England's most breathtaking beaches and only a few miles from your cottage, this is undoubtable one of the finest beaches in the country. With apricot-coloured sand, towering dunes and views to the dramatic medieval ruin of Dunstanburgh Castle, you will rarely find such a dramatic setting. Its giant dune system shelters some quaint thirties summer houses; indeed Embleton seems lost in a time warp, and is still totally uncommercialised thanks to the protection of the National Trust. It's magical! There's also an intriguing collection of wartime pillboxes, which remain only because access across the adjacent golf course was denied to the demolition gang. A great golf course where visitors are welcome for food and drinks at the golf club, just off the beach. Great for kids. Holy island is a tidal island and vehicles can only cross when the tide is low. Tidal times vary so check before leaving home. 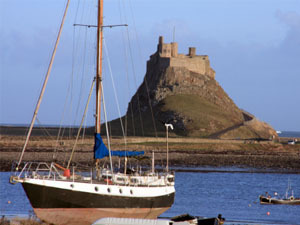 Also known by its Celtic name, Lindisfarne it was one of the principal centres of Christianity in the Dark Ages. There is a Priory, (English Heritage) which was founded by St Aiden but was dissolved and ruined in 1533 by Henry VIII in his dissolution of the monasteries. The castle that looks out to the sea was built using the stone from the ruined monastery. You can visit the castle, which is a National Trust property. The island is one of the top locations for bird watching in the North East. The sand dunes and salt marsh are a national nature reserve and an important winter home to thousands of seabirds. Sandy cove set in extensive rocks that skirt the headland and are exposed at half-tide. Access to the cove is by road from Low Stead Farm. This is a private little beach great for kids. Second cove to the left of the end of the lane is the best beach. Alnwick, home to the powerful Percy family since 1309 has the best surviving Barbican castle in Britain. The castle grounds are famous for their Hogwarts connections as this is where much of the first Harry Potter was filmed. The spectacular Alnwick Gardens created by the Duchess of Northumberland is a must see, with the world’s biggest tree house, also a restaurant, hundreds of fountains and a poison garden. To pass through into the cobbled market town you must go under the narrow Hotspur gate which leads you into a bustle of market life. It retains much of its medieval character with some stunning architecture and the town boasts its own theatre. There are many good restaurants and shops. Alnwick is also home to the famous Barter books, the largest second hand bookshop in Britain. othbury is one of the main tourist centres of Northumberland and is a small market town in the beautiful Coquet Valley. Although technically a town now it still maintains a village feel about it with lots of shops, hotels and houses clustered on the banks of the river. The views are spectacular from all directions and there is something to offer all through the year. A mile to the east of the town lies Cragside House, Gardens and Estate (National Trust) which was the first house in the world to be lit by hydro-electricity. Home to Lord Armstrong in the 19th century, a Victorian inventor, Cragside House was the wonder of its age. Built on a rocky crag, it is crammed full of ingenious gadgets with lots of places to explore. Rothbury is surrounded by some lovely walks and countryside with lots of Northumbrian character.